I have posted much about this on IheartPGH yet, but there is no time like the present, especially when it involves pierogis. I am working on making a directory and map of local blogs over on BlogLocal.net. To celebrate the holiday season we are giving away some local ornaments. We have just posted the Pittsburgh ornament – a handmade pierogi of course. 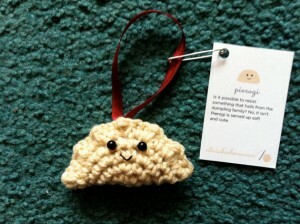 You can read more about this little guy and enter to win a pierogi ornament for your tree here. To enter just leave a comment on the BlogLocal post with a link to your favorite local blog – it can be a Pittsburgh blog or a blog from any other city as well. Please feel free to submit more local blogs to the directory on the BlogLocal submit page as well.